Hey, did you hear? I won Top 100 in the 2016 National Audubon Photography Awards. Audubon chose from a pool of 7,000 images that came in from photographers in every state in the USA and 6 provinces of Canada. I just knew that Least Tern was special! The awarded image involved many days of 4am wake-ups so that I could reach a local Least Tern colony each morning by dawn. This particular morning was free of any fog or weather, and the sun had just broken the horizon for the start of a saturated blue sky day. One of two Least Tern chicks fully hatched this morning, finally breaking through the outer egg shell. While watching the mother care for her new chick on the nest, the father (seen here) quickly gathered the shell pieces and carried them far away from the nest. What's interesting is that the scattering of shells isn't for the protection of the parents or new chick, but for the one or more intact eggs remaining on the nest. 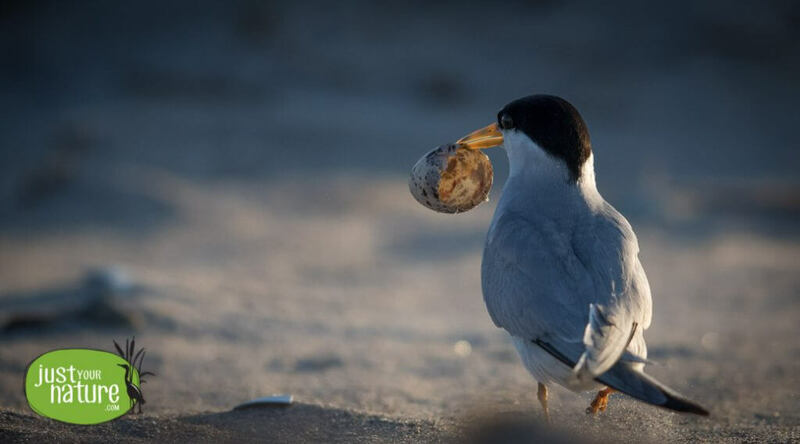 I stumbled across an article titled "Empty Shells" over on stanford.edu that mentions Niko Tinbergen, who studied the shell-disposal behavior of Common Black-headed Gulls. His experiments reportedly proved that the farther from an intact egg an eggshell was placed, the safer the intact egg.